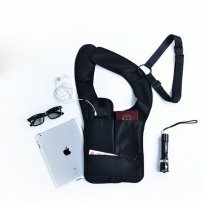 Outdoor Anti-Theft Hidden Underarm Bag / Shoulder Bag for iPad / iPhone / Smart Phones / Tablets : allputer.com - Accessories for all your Portable Electronics & Computers! The item is a practical and cool mens anti-theft hidden underarm shoulder bag backpack, which is made of high-grade anti-scratch and waterproof nylon and breathable mesh materials, and can be used to safely store, organize and protect your iPad, iPhone, MP3, keys, ID card, credit card, wallet and other small personal belongings. Multi-function suspension system on the shoulder place can be used to easily hang your earphone, sunglasses, interphone, mini LED flashlight. Therefore, when the hidden underarm shoulder bag is very applied to your suit or jacket, no one will find you wearing the shoulder bag. It is very practical for working, going home, and business trip. - Shoulder belt allows it to be worn across the body. - Three pockets on the front side, to safely store, organize and protect your iPhone, cellphone, keys, pen, passport, cash, Pen, MP3, and other small belongings. - A breathable mesh big pocket on the back, to store your iPad and other items. - Great for any small parts, phone, wallet, torch, player and so on. - No iPad / Earphone / Flashlight, earphone, money, passport... will be included, just the arm bag will be shipped.